You can use the tools in this month’s toolbox to create a storage area network, compare Microsoft Excel worksheets or speed up your scripting. Traditional Storage Area Networks (SANs) used to be a nightmare to configure and maintain. These days, they’re much easier to manage, upgrade and segment, but the cost of entry is still quite high. With the increase in server infrastructure virtualization, SANs have become almost commonplace. One lower-cost alternative is StarWind Software iSCSI SAN Software. The StarWind solution uses traditional Windows server infrastructure to create an iSCSI SAN. The software can serve as the storage back end for virtualized servers such as VMware ESX server and Microsoft Hyper-V, as well as standard server applications such as Microsoft Exchange, SQL Server or any application requiring networked storage. Because StarWind uses the iSCSI storage protocol, you can use your existing IP or Ethernet network as the backbone. For larger installations, it’s probably a better idea to use a dedicated storage network so you won’t have multiple resources taking up the bandwidth and backplane. This will give you better overall performance. Another nice feature of this approach is that you won’t have the added costs of a FibreChannel infrastructure required by many high-end SANs. It only takes a few minutes to add a new storage location or target to your network. Select an alias; customize the target iSCSI name if necessary; choose whether the target is a physical or virtual hard disk, optical drive or tape device; choose your access mode; and, finally, whether to allow simultaneous connections. For virtual hard disks, you can create a basic, single virtual disk that points to either a RAM disk or an image file. You can also create mirrored, snapshot, Continuous Data Protection or one that supports the StarWind high-availability configuration. Both the optical and tape targets also support both physical and virtual devices, so you can quickly tailor it to suit your storage needs. 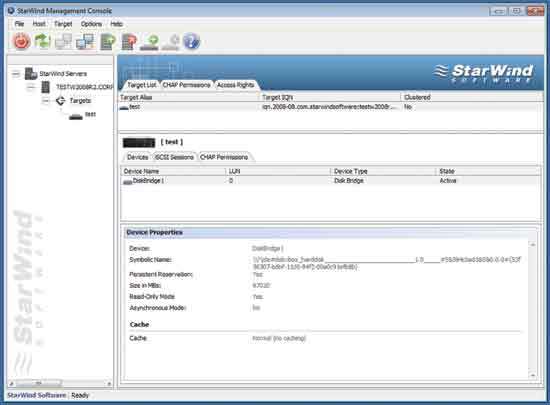 iSCSI SAN Software has a number of key features for any SAN. It fully supports Challenge Handshake Authentication Protocol (CHAP) for secure authentication; Multipath I/O (MPIO) for increased throughput; IPSec for tunneling and connecting remote targets for replication; and Microsoft Volume Shadow-Copy Service (VSS) for taking snapshots of your data. A few other cool features of StarWind iSCSI SAN Software include synchronous data replication across a two-node storage cluster; a “fast synchronization” failback for getting back to your original system when you failover; wide area network (asynch/remote) replication, and point-in-time clones and snapshots. The entry-level price point for StarWind iSCSI SAN Software is $995, but you’ll need to pay more for the version that supports high-capacity and -availability options such as synchronous mirroring, remote replication and automatic failover. Undoubtedly, you’ve had to compare one CSV or Excel file with another and pick out the differences. A simple line-by-line comparison may work for a CSV, but it definitely won’t work for an Excel file. If just the precision of the values changed, every row would appear different. In a larger spreadsheet, it would be quite difficult to tell why the precision of the values changed. Workshare Compare for Excel from Workshare Inc. can simplify Excel file comparisons. Much like a merge/diff tool, creating a comparison is as simple as picking two files to compare. Once you’ve run the comparison, you’ll see your two spreadsheets in the upper panel side-by-side. The cells containing differences are highlighted in a color representative of the difference noted. 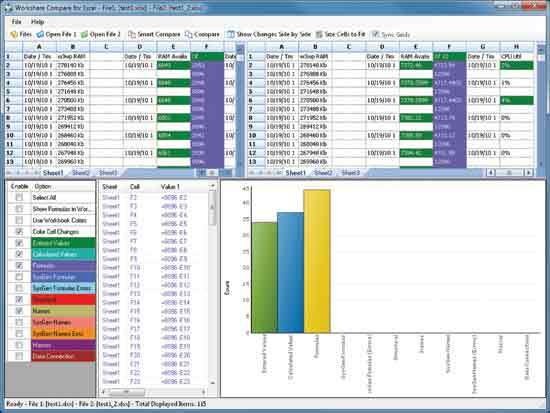 Workshare for Excel can show a number of different variations, including entered values, calculated values, formulas, sheet structure, names, macros and data connections. Toward the bottom of the screen, you’ll see a panel listing all the differences in an ordered, color-coded list. Clicking on a difference will take you to the row and cells in the upper panel so you can further explore the discrepancy. You can also enable and disable the different comparison options to clear your view of unneeded comparisons. On the second panel of the bottom part of the UI, there’s a bar graph with the count of each type of detected discrepancy. Other comparison options include whether to process inserted and deleted rows or columns, as well as whether or not to include system-generated changes in the results. Workshare Compare for Excel is $145 for a single license. Workshare has similar products for comparing Word, PowerPoint and PDF files. Automation is a key element of successful systems administration. Why go through all those steps if you can just write a script to do it for you? There are a number of powerful scripting tools out there, including Windows PowerShell and VBScript, but they all have a bit of a learning curve. 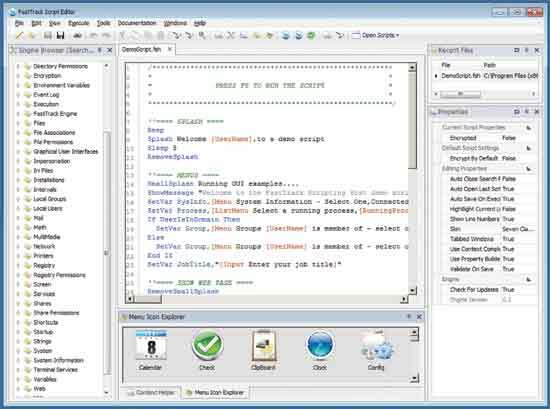 FastTrack Scripting Host from FastTrack Software aims to make it easier to create scripts. The application touts “one operation—one script line.” The goal is ease of use through high-level automation rather than programming, so you can focus on administration instead of development. The package includes two primary components: the FSH.exe script execution host and the FastTrack Script Editor. The latter is your IDE for creating, modifying, organizing and debugging your FastTrack scripts. The default layout of the IDE editor has a familiar feel, with tools or script parts on the left pane, a color-coded script editor in the middle and a properties view on the right pane. To create a script, drag an operation from the tools pane (called the Engine Browser) to the editor pane. The scripting language supports the usual conditional and looping statements. The scripts have an easy-flowing Visual Basic feel. The editor gives you type-recognition help similar to Microsoft IntelliSense within Visual Studio, so you won’t have remember the minutia of every single command. This greatly expedites development time. You’ll have more than 50 categories of operations to choose from in the Engine Browser, ranging from Active Directory operations to printing and zipping. There are operations to set environment variables, encrypt or decrypt files, and execute other applications or batch files. You can run automated installations, impersonate users and modify shares. All of these tasks are well-suited for automation. You could also use the FastTrack Scripting Host to assign Group Policies; create logon, startup, shutdown or logoff scripts; help with compliance by easily showing your company logo with a privacy notice; or even connect to the Web to retrieve and process XML information. Your scripts can also have near-automated graphic interfaces with drag-and-drop components. You can drag splash screens, menus, inputs, multi-inputs and conditional UI components to speed up script creation. FastTrack Scripting Host is licensed on a per-seat basis. For 25 seats (or machines that will run the host) it will cost you about $450, with volume discounts as you go up in the number of seat licenses. There’s a full-featured 45-day trial available from the Web site. There are also a number of guides and examples on the product Web site to help you get up and running quickly.